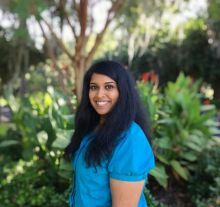 Home About the Center Postdoctoral Researchers Shreela Palit, Ph.D.
Shreela Palit, Ph.D. began her postdoctoral research fellowship at the Pain Research and Intervention Center of Excellence (PRICE) at the University of Florida in September 2018. She earned her B.S. in Psychology and both her M.A. and Ph.D. in Clinical Psychology from The University of Tulsa. In 2018, Shreela completed her clinical internship as a behavioral medicine resident at the University of Washington School of Medicine in Seattle, WA. Shreela became involved in conducting pain research as an undergraduate student in 2008 and was awarded a National Science Foundation (NSF) Graduate Research Fellowship in 2013 that recognized her potential contributions to science and education and supported her pre-doctoral training. To date, Dr. Palit’s research has focused on exploring mechanisms influencing pain processing, primarily through the use of psychophysiological assessment and quantitative sensory testing methods. Her dissertation examined the feasibility of an enhanced biofeedback intervention for chronic musculoskeletal pain. Dr. Palit’s current research interests include further investigation of biopsychosocial determinants of pain across the lifespan, as well as development of novel psychological interventions and enhancement of existing treatment approaches for chronic pain management. Under the mentorship of Dr. Roger Fillingim and Dr. Emily Bartley, Shreela is involved in various studies at UF as part of her postdoctoral training. These projects include examining ethnic group differences in pain and psychosocial functioning in knee osteoarthritis (UPLOAD-II), as well as understanding the influence of adaptive/protective factors on pain, with a specific focus on the development of treatments involving promotion of resilience in patients with chronic pain.